This is my first time participating in Dewey’s Weekly Geeks. This time, it sounded too fun to resist. We’ve each interviewed another participant about a book she’s read, and we’re posting both reviews together! You, the reader, get two reviews in one post. WL: The Story of the Stone is a Chinese novel, written by Cao Xueqin, who lived from 1715?-63. I read the David Hawkes translation. The first edition was published in 1792. 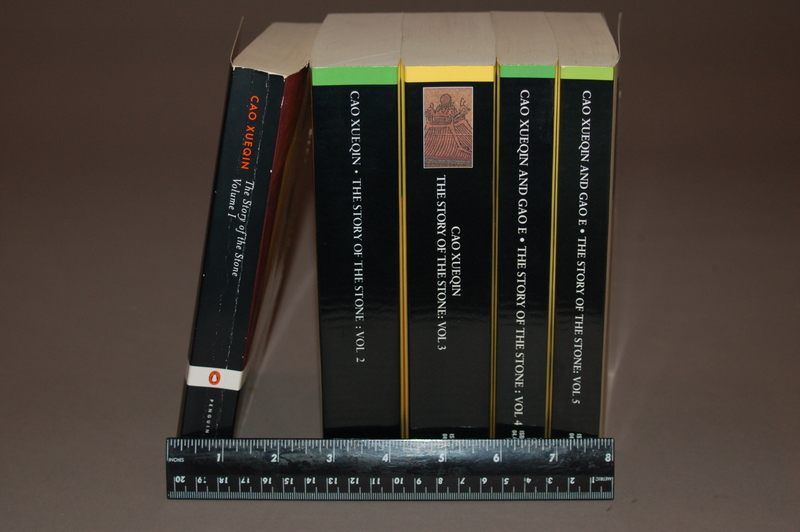 Throughout the five volumes it’s published in, the chapter numbers are consecutively numbered — volume 1 ends with chapter 26, volume 2 starts with chapter 27 — so I really consider them one book, even though each volume subsequent to the first has a unique name. It contains, to some degree, a “sandwich” of what I take to be a Chinese legend, although I don’t recall if that’s something I read or if I just assumed. The large majority of the story, though, chronicles the life of a boy, Bao-yu, and the girls who he grows up with, along with their very large, very wealthy family and its triumphs and trials. The book is at least somewhat autobiographical, although some facts were changed intentionally to lessen that correlation. When the book came out, it was apparently potentially dangerous (seditious), so this would have been important. S: What book or author would you compare these to? WL: I’ve heard The Story of the Stone called the War and Peace of Chinese literature, since it’s the preeminent Chinese classic. It’s also sweeping, epic, like War and Peace. Of course (depending on what kind of comparison you’re looking for) the culture of the book is clearly dissimilar to Tolstoy’s work, but I haven’t read enough Chinese literature to be able to make comparisons for you there. S: Why did you decide to read these books? WL: I knew I wanted to read Story of the Stone as soon as I learned it was a classic work of Chinese literature. I’ve been interested in and intrigued by Asia for about a decade now. After I learned in contained poetry, I knew I wanted to read the Hawkes translation; this one at least attempts to maintain the rhythm and feel of the text, rather than just translating literally, word for word. S: Did you read all five volumes? If so, which volume was your favorite? Least favorite? How long are each of the volumes? WL: I did read all five volumes. As I said earlier, I really do consider it just one book. Probably the first and second volumes are my favorite parts, though. It really takes more time than than for the characters’ true identities to come to light. I think of these as more happy, more innocent, than the later volumes. Each one really does have high points. That’s a total of 2,480 pages. I didn’t include the appendices in the page counts. S: Summarize the story in a couple or three sentences, but remember, no spoilers! WL: The Story of the Stone details the lives of Bao-yu and his female cousins, (and the rest of the huge family) from the elaborate parties they host and the poetry (writing) club they form when the government favors them to how they function when its not. It brings to life a time in China’s history and shows the culture and how people lived; it entails peace and corruption. S: What was your favorite thing about these books? WL: That’s hard to say. I really loved them so much, for so many reasons. I loved the window into China that it opened for me. I loved the vocabulary, I was fascinated by the medical remedies used when someone was sick and the education processes, I was struck by the beauty of the environment, and the so-stark contrast in the book between rich and poor. It entails beautiful imagery, hilarious dialogue and intriguing characters. S: What was your least favorite thing about them? WL: I can’t really say, without a spoiler. But it’s a minor point, anyway. S: Who was your favorite character in the story and why? WL: My favorite character is probably Dai-yu, one of the cousins. I felt a kinship with her. She’s frail but strong, and incredibly smart. Her plight isn’t the most stable, either. I’m also a fan of Bao-yu’s grandmother, Grandmother Jia. She’s smart, discerning and kind. The matriarch of the family bears a large load. S: To whom would you recommend these books? 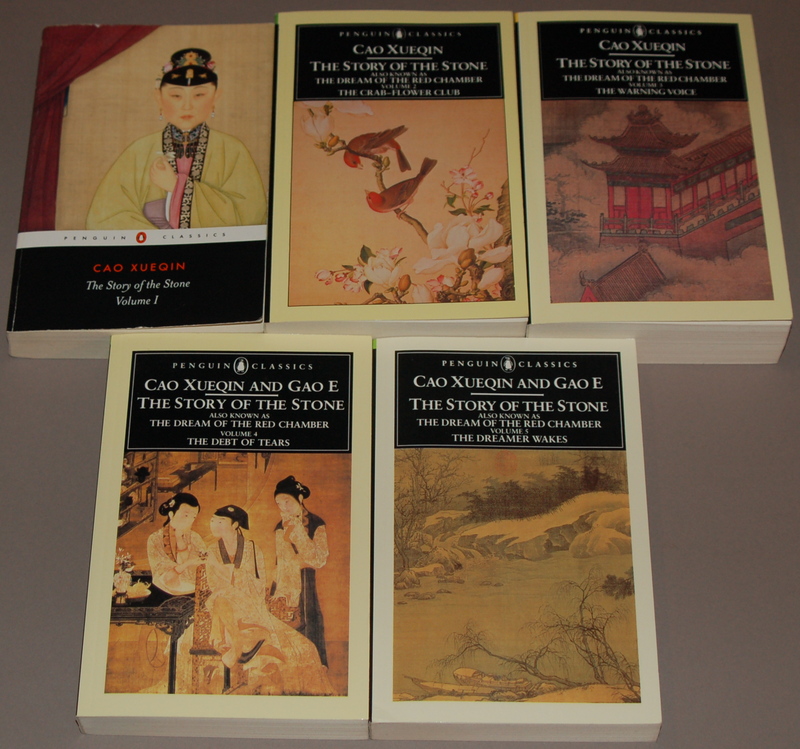 WL: I would recommend The Story of the Stone to anyone interested in literature of the world, or of Asia in particular. Readers who enjoy historical fiction. Avid readers; I might not recommend it to anyone who hasn’t made it through (or at least if they don’t want to read) War and Peace. S: How would you rate this book on a five star rating scale (1 the worst, 5 the best)? WL: I’d have to call it a 5, there’s really no deliberation needed for that one. WL: Ooh, reading the Amazon synopsis, this sounds like an intriguing book. I hadn’t heard of Bryson or his work before, but it sounds quite readable. Do you agree? S: Yes, this book was VERY readable. Wonderful narrative. “Reads like a novel” as they say. WL: Did the book live up to what you’d heard before picking it up? S: Yes, I’d heard it was “laugh out loud” funny, and it was. I did laugh out loud, and that’s someting I don’t do a whole lot while reading. WL: What made you pick this one as your first foray into Bryson’s writing? S: Hmmm … not sure. I think it was just the first one I’d heard of. Since then I’ve seen many of his others out there, but this one just stuck in my mind. Also, the idea of hiking such a huge long trail is very intriguing to me, though I could never in a million years do it. WL: I don’t read much nonfiction. How does this book convey story? Plot? S: Well, there’s not a whole lot of plot. Bryson and his friend decide to hike the Appalachian Trail and so he tells about it. You do wonder if they finish or not… and what kind of mishaps they have… all which make a great story. But for the most part, the people they come across and the struggles they have are the real story. So I think he does a great job turning this nonfiction subject into a really fun story. WL: What did you think of the writing style? S: The writing style is wonderful. Witty, funny, easy to read, amazingly descriptive. I loved it. WL: So what was the best thing you learned from reading this book? S: If you dream about doing something, just do it. I also learned to appreciate nature and trees and wild animals and all that wonderful outdoorsy stuff and how we should not take it for granted. WL: Will you be reading more of Bryson’s work? If so, what next? S: I will for sure read more of his books, but I’m not sure what. Perhaps the one about his growing up years called The Life and Times of the Thunderbolt Kid. WL: Fair enough. Anything else you want to say about A Walk in the Woods? S: Go read it! Especially if you’ve ever done any backpacking, but even if you haven’t you’ll still find this funny and interesting. This entry was posted in books, fiction, nonfiction and tagged communication, internet, literature, reading. Bookmark the permalink. Great interviews! The Story of the Stone sounds like a wonderful read, it must be a terrific way to learn of the historical Asian culture. I loved A Walk in the Woods. I like Bryson. I must check out the other book too. It looks good to me! Thanks! I thought it was great.